To help meet customer requirement SKYVVA is committing to provide a different mode which supported for inbound processing. With the varieties of modes you can integrate all kinds of data into salesforce. This tutorial enable you to know the way to use and why you need these modes. You can integrate data in different modes including Synchronous, Asynchronous, Batch Processing, Bulk Processing(SKYVVA Bulk and SFDC Bulk), and Automatic switch. As for this section, you will be understand each modes functionality. All SKYVVA modes processing are working differently. In this tutorial, we’ll discuss when and why these modes use. Synchronous mode is called when integrate then create real time message along with posting each objects. You can use this mode when you want to integrate a small amount of data. To get the better understanding of the Synchronous mode, you first need to know how to configure the posting behaviour. The following screen shot below show the way to configure this mode. – Enter interface detail page and scroll down to Runtime Configuration-Inbound section then click on Inbound Posting Behaviour pick list to select Synchronous. – After selecting the interface you will be land on Interface Source Definition a place where you can configuring the adapter. To create adapter please click on this link (How to create adapter in Agent). After creating the adapter, you can test the Query to see the data and then save it. To be able to integrate your data you can either process them manually or use the scheduler. This section will show how to do scheduler. – Select the name of Integration and interface along with Integration Mode then turn on the schedule and choose the time you want to run. Asynchronous, when integrate is called then create messages and process asynchronous (future). However, as an end-user you should not use this method since the processing might be not in order and inaccurate in posting data. Note: The steps of integration and setting up the scheduler is similar to Synchronous mode. If you want to know how to do it, please follow the steps, which portray in Synchronous mode. Batch Processing is one of important mode in SKYVVA, which enable you to integrate your data into Salesforce. Batch processing uses for running batch job. It has more capability than synchronous and you can check job monitoring. The Records have more than 200 but less than 5000, so we use with batch processing. It can store many records in one batch, and you can set time interval in batch processing scheduler of SKYVVA to run anytime that you want. 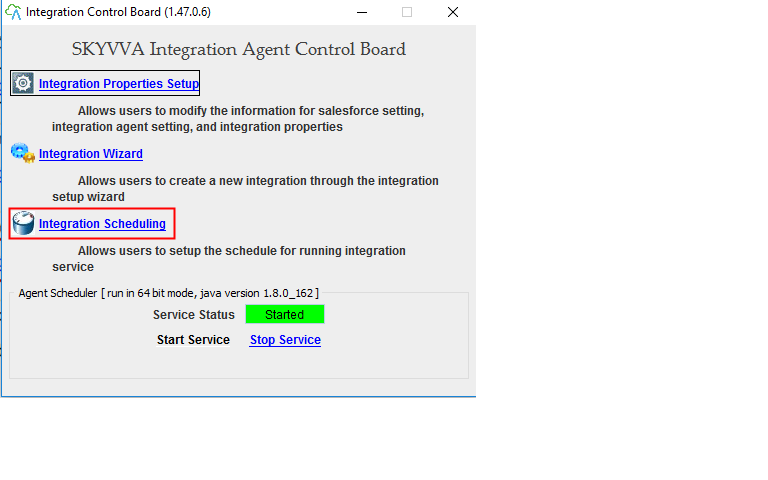 As an example, this tutorial portray the integration from Agent to Salesforce. However, the process of integration is similar to Synchronous. Please kindly check out content 2.1.2 if you want to know how to integrate from Agent. All the data, which you had integrated, are storing in Working Baskets. If you want to process them, you can set the schedule to run or manually process them. This step is showing you how to set the schedule to run the attachments. To set schedule you can select on Scheduler Tab and set the time as your desire. Bulk Processing uses for running attachment as batch too. It has more ability than synchronous, batch and running with huge records at high speed. The Records have more than 5000, so you use with bulk processing. It can contain many records in an attachment, and you can set time interval in bulk processing scheduler of SKYVVA or Agent Scheduler to run anytime that you want. However, there are two options of bulk processing which is including SKYVVA bulk and SFDC bulk. The following section will be explain more detail about these two modes. BULK Mode: Check this flag if you want to run interface in a bulk mode using Salesforce BULK API. Bulk Version: We support SFDC pure bulk mode in version 1.0 or 2.0. Then we have our own SKYVVA bulk mode. This use SKYVVA workflow and mapping and thus are more powerful but slower than the pure bulk api technique from Salesforce. This one is SKYVVA own bulk mode. 1. Parallel: When you select this processing mode, it will run parallel. 2. Serial: When you select this mode, it will not run at the same time. Bulk Package Size: This parameter determine how many records is splitted into Bulk data size. If your Message contain 10.000 records and the value for this parameter is 1000 so you will get 10 bulk data set in Salesforce. Bulk Monitor Keep Size: The number of bulk execute logs to be keep. Bulk Sch Frequency: This is the schedule time frequency for bulk scheduler on interface. Bulk Integrate Time Interval (minute): The interval (minutes) used for integrate bulk job scheduler. 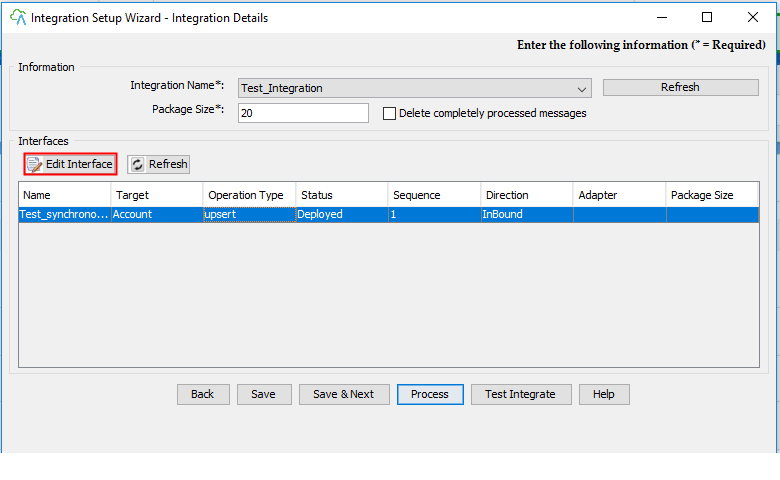 For example, if its value is 10, then the integrate bulk scheduler will be run every 10 minutes. SKYVVA Bulk is slow but very powerful, it allows you to do business mapping using our mapping tool and formula. Likewise, you can use SKYVVA workflow to validate the data before posting. You can use SKYVVA Bulk mode with both Bulk-processing mode, which are Parallel and Serial. The default value is Serial. When you check this flag, it mean you activate the bulk processing and your data will be integrate from Agent. This part will show the example by integrate the data from Agent. To be integrate from Agent, you have to create adapter. To create adapter in Agent please check this link (How to create adapter in Agent). As you done integrate, your data you might want to check or monitor if all your data are successfully integrated. To monitor bulk data, please log in to Salesforce and enter Bulk Control Board. If you want to know more and how to use Bulk Control Board please kindly look for this documentation (How to use Bulk Control Board).